*Capacity ranges shown are nominal. Specific pressure drop considerations may narrow or broaden the range of capacities. 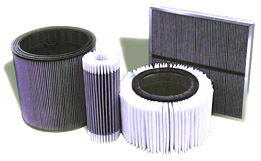 Note: Care should be exercised in the selection of type and size of Filters and Filter Silencers. Although this product catalog is designed to assist the user in proper selections, it may still be advisable to contact Universal Silencer's engineers for additional assistance. Inquiries are welcome and will be given prompt attention. The Filters and Filter Silencers listed on the following pages are available with a variety of types of filter panels, each having its own restriction characteristics. Conse­quently, the pressure drop data below are presented in such a way that two components must be added to obtain the total pressure drop for a specific filter application. 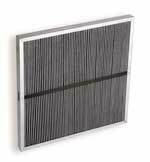 One component is the restriction attributable to the filter housing exclusive of filter panels. The second component is the restriction through the filter panel media. The housing pressure drop is given in graph form as a function of air flow in CFM versus restriction in inches of water gage. The pressure drop component for the filter panels is charted in tabular form - giving pressure drop in inches of water gage at various flows in CFM. Pressure drop calculation example: FSH type Filter Si­lencer is required for 2500 CFM air flow. Type P-11 high efficiency filter panels. Pressure drop limitation - 3" water gage. Try FSH10-2 (page 4) with nominal rated capacity of 2750 CFM. Enter graph at 2500 CFM and go vertically to 10" parameter line. Go left to pressure drop scale and read 2.6" w.g. FSH10-2 is equipped with two panels, thus each panel will handle 1250 CFM. Pressure drop chart for filter panels indicates 0.44" w.g. for P-11 type filter panel at 1250 CFM. Add 2.6" and 0.44" for total of 3.04" w.g. pressure drop. Note: Pressure drop values indicated by the graphs on this page include pipe entrance pressure drops attribut­able to the atmospheric end of the inlet pipe. These drops are significant. contributing in some cases as much as 75% of the total pressure drop, and should not be regarded as excess restriction due to the filter. However, adding the filter to the system transfers these pipe drops to within the filter housing and a pressure drop reading taken at the pressure tap on the filter outlet reflects the total - pipe entrance loss, velocity pressure, and housing restriction. Thus for convenience, and to avoid confusion, the graphs are designed to indicate this total.